At last! After long winter months of running in school hallways. After endless hurdle drills on linoleum and cement. After dreary, dark training runs on icy roads—Spring had sprung. We were finally the recipients of a beautiful, sunny Spring day, and, track coach that I am, it was time to rejoice. Although it was partly snow-covered, 200 meters of our outdoor track had melted. With that familiar spring smell of fresh air and melting dog-doo in our nostrils, we were finally ready to do some serious damage in track practice. To begin the deadly serious business of winning city, regional and provincial championships… and who knows—maybe even qualifying for the Olympic trials later in the summer. It was a Saturday sprinters’ practice and our racehorses were ready to tear up the track, unfettered by the threat of looming hallway walls and locker-door collisions. But surprisingly, two of our distance runners also showed up for practice. I was surprised because their Saturday workout was just an optional, easy distance run. These two girls, 14 and 15 years old, were elite cross-country skiers who enjoy running in the summer time. “We’ll just go for a run,” they said as they left the track at a slow jog. I assumed they would head down the road where the footing was safe. Our stadium is in a beautiful setting: surrounded by rocky hills that are criss-crossed with skiing and jogging trails. Although these trails are popular in mid-winter and summer, in the Spring they’re a no-man’s land of mud, ice, partially melted snow and leafless trees. It was part way through our workout that I realized the girls had headed onto these trails. My first clue came 20 minutes before they actually jogged back into view—a fanfare of giggles and screams and laughter echoing sharp and clear off the hills. Another fast 200m for our sprinters, then another. I kept peeking up into the hills, waiting for the source of the laughter to appear. And then I saw them. Both girls, wearing only T-shirts, shorts and shoes, sliding down a snowy slope on their butts. And laughing like crazy. Landing at the bottom, they ran back up the hill and slid down standing up—cross country skiing without their skis. Their “run” completed, they jogged back to the track, climbed our timers’ stand and lay on their backs, their muddy feet flopped onto a handrail. Contented, they just lay there, soaking up the sun and the warmth and the fresh air. For the girls, it had been a great afternoon. No video games, no high-tech toys, no television, no organized team competitions—just a muddy trail, a pair of shoes, a sunny day and a friend to enjoy them with. One of my older girls remarked, “Teenagers really are annoying at that age. All they do is giggle.” I didn’t say anything, but I had to disagree—I left that practice feeling happy, and carefree, and very young. It had occurred to me as I watched them sliding down that hill—and I can still hear their laughter echoing off the hills as I write this article—that this is what sports, and fitness, and the professions of coaching and physical education are really all about. Winning and excellence and personal improvement are admirable goals. But in it’s essence, sport is really just play. Necessary play. And the joy that comes with movement, and being fit and interacting in a physical way with nature. And being young…and (for us older folks) realizing that by being able to play, we can experience the joy and innocence of youth all of our lives. 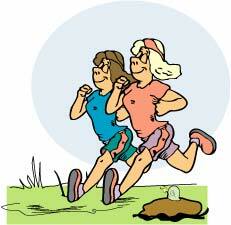 This entry was posted in cross-country running, physical education, running, youth fitness by Richard Moss. Bookmark the permalink.